Thyroid eye disease (TED) or thyroid orbitopathy (TO) is an eye condition that usually affects patients who either have, or have had, dysfunction of the thyroid gland, although approximately ten per cent of patients never develop thyroid dysfunction. The reasons for the association of under- or over-production of thyroid gland hormones (hyper- or hypothyroidism) with the eye disease are not completely understood. TED is an autoimmune disorder, caused by the reaction of antibodies and some white blood cells (lymphocytes) to cells in the eye muscles, as well tissue and fat in the eye socket (the orbit). This condition happens in most hyperthyroid patients as a by-product of excessive thyroid hormone production. TED affects women more than men and usually occurs when the sufferer is between 30 and 50. It typically features inflammation of the eye tissues, particularly the eyelids, the eye muscles and the soft-tissue in the eye socket. The eyes feel painful, red and watery, especially in sunshine or wind. The covering of the eye (the conjunctiva) is inflamed, red and swollen. The eyelids and tissues around the eyes are swollen with fluid. The eyes appear staring, often because the eyeballs bulge out of their sockets — a condition known as proptosis or exophthalmos. Because of eye muscle swelling, the eyes are unable to move normally and there may be blurred or double vision. Eyelid swelling is usually worse in the mornings. 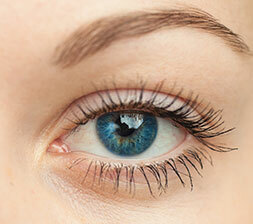 Pain behind the eye or during eye movements is another common symptom. Patients often report a change in the appearance of their eyes — old photographs can help to confirm this change. In severe cases, vision may be threatened because of compression of the optic nerve in the apex of the eye socket. This, fortunately, is rare and happens only in approximately five per cent of cases. It may be reversible if the pressure on the optic nerve is relieved. Severe bulging of the eyes can also cause significant drying of the front surface of the eye (the cornea) and blurred vision. It is essential to see an ophthalmologist if you feel your vision has recently become blurred or dim and, in particular, if colours appear to be washed-out. Smoking and diabetes are considered risk factors. TED may take place at the same time as other autoimmune conditions, including Myasthenia Gravis, a rare muscle-weakening disease. As with other autoimmune diseases, TED often comes and goes on its own. There is usually only one acute inflammatory episode, known as the active phase, but this can last up to two years and the effects may persist for years or be permanent. Although there may be some reduction of the prominence of the eye, eye movements often do not return to normal. Eyelid position is also likely to be affected, sometimes creating persistent problems in closing your eye. Your initial consultation is crucial to the success of any treatment. It is your chance to explain and discuss your hopes and fears, so it may help if you write down a list of ideas and questions in advance. You may want to bring along a friend or family member for moral support or to ask additional questions. It allows Mr Kamalarajah to review your medical history and lifestyle, photograph you (with your permission), assess your suitability for treatment and explain your options. Finally, you can discuss possible procedures together so that you have a thorough understanding of what can be achieved and what risks there might be. After the consultation, Mr Kamalarajah will write to your GP summarising the consultation. The first step is to correct any thyroid dysfunction. This alone will often improve the eye condition. Stopping smoking is the single most effective way to improve symptoms. Discomfort and dryness can be improved by humidifying the air. Wrap-around, polarizing sunglasses can help to reduce glare. Lubricant eye ointment at bedtime and artificial tears during the day will help to maintain moisture in the eye. Eyelid swelling can be reduced with cool compresses and by keeping your head raised while you sleep. Covering one eye immediately relieves double vision — it doesn’t matter which eye is covered. Double vision can also be improved with the use of fresnel prisms placed on spectacle lenses to help re-align both eyes. Recent evidence (New England Journal of Medicine 2011) suggests that patients who take a supplement of selenium 200 micrograms a day for 6 months during the active period of inflammation acheive a greater improvement in the condition of their eyes. This is most likely due to underlying mild selenium deficiency. Steroid therapy or immunosupression has a 65 per cent response rate and is effective in reducing soft tissue inflammation. Steroids may be prescribed as tablets over a six- to 12-week period. Steroid-related side effects are relatively common. These include weight gain, raised blood pressure, blood sugar elevation that can lead to or worsen diabetes and an increased risk of osteoporosis (thinning of the bones) and joint damage. In order to minimise these potential complications, other methods of administering steroids are available. These include pulsed intravenous (IV) steroid injections (either repeated daily for three days, or weekly for a short period) or local injections of steroid around the eye, known as periocular steroids. Periocular steroids are safe but can briefly cause the pressure in the eye to increase, requiring monitoring and possibly treatment. Immunosuppressive drugs such as Cyclosporin or Azothiaprine may be used in combination with steroids in severe cases that are not responding adequately to steroid therapy. Low-dose orbital radiotherapy may be used to suppress inflammation and is usually given daily on an outpatient basis for two weeks, in combination with steroid therapy. Side effects of radiotherapy can include hair loss at the temples and a brief increase in soft tissue inflammation during treatment — this occurred in 14 per cent of cases in one study. Radiotherapy can affect the blood supply, in the long term, of any tissue treated and is therefore generally avoided in patients with diabetes, particularly if diabetic changes to the retina are already present. It is also avoided in young patients because of the theoretical increased risk of tumours developing in the future, although, to date, no such cases have been reported. The thyroid actively accumulates iodine, which it uses to produce the thyroid hormones needed for normal body function. RAI is like iodine found in foods such as fish, seaweed and iodized salt but it releases an electron that disrupts the function of some of the thyroid cells. The more radioactive iodine is given, the more cells cease to function, so excessive amounts of thyroid hormones are no longer produced and symptoms of hyperthyroidism begin to disappear. The RAI is either dissolved in water or given as a capsule. After treatment, symptoms improve slowly, beginning about two weeks later. To prevent recurrence, enough radioiodine is usually given to cause the thyroid to become underactive around six to 12 weeks after treatment. You then have to take a daily dose of thyroid hormone, T4, for the rest of your life. Very few people need a second course of RAI. A few people find their thyroid returns to normal but it will eventually become underactive. There is a risk of TED becoming worse after radioactive iodine treatment, particularly if you have eye disease in the active phase. I usually recommend simultaneous steroid therapy or, possibly, an alternative method of therapy in these circumstances. The radiation will be beneficial to the patient but not to others around them, so you need to take precautions for around 11 days. A minute quantity of radiation will be stored in your body until it is flushed out. Avoid sitting near other people, especially children and pregnant women. Keep a distance of at least an arm’s length from you will see for more than two hours a day. Avoid prolonged contact with others – no plane or train journeys, visits to the theatre or cinema, long car journeys with others or watching television next to others for an evening. Do not share food or drink. Rinse cutlery, dishes and glasses separately before washing. If using paper plates and plastic cutlery, dispose of them outside the home immediately after eating. Drink a lot of liquid, go to the lavatory often and flush the lavatory twice each time. Mop up any spills. If you exercise and sweat a lot, wash work-out clothing separately. No breast-feeding after the treatment – RAI will come out in breast milk. Do not become pregnant for six months after the treatment. You may get a sore throat or become mildly nauseous – it is best not to eat for two hours before or after the treatment. Your salivary glands may swell for a few days. Surgery is generally reserved for quiescent (inactive) disease, once inflammation has settled. The exception is urgent orbital decompression for loss of vision caused by compression of the optic nerve (optic neuropathy). Thankfully, modern medical therapy has made emergency decompression rare. 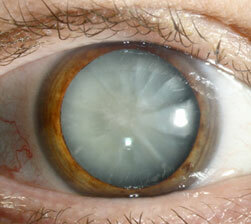 If orbital decompression is needed, it is performed first to bring the eye back into the socket. Orbital decompression involves expanding the bony walls of the eye socket (orbital cavity) and is often combined with removal of some orbital fat. This decreases protrusion of the eye and reduces pain and discomfort. The most common complication is of new or worsening pre-existing double vision, known as diplopia. This has been reported in up to 15 per cent of cases. The risk of blindness is less than one in 600. Double vision that persists may be either controlled with prisms or require eye muscle surgery (strabismus surgery) in order to align both eyes better. This is usually performed as day case surgery. 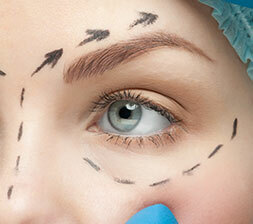 Eyelid surgery is then available to improve the staring look, if this persists. 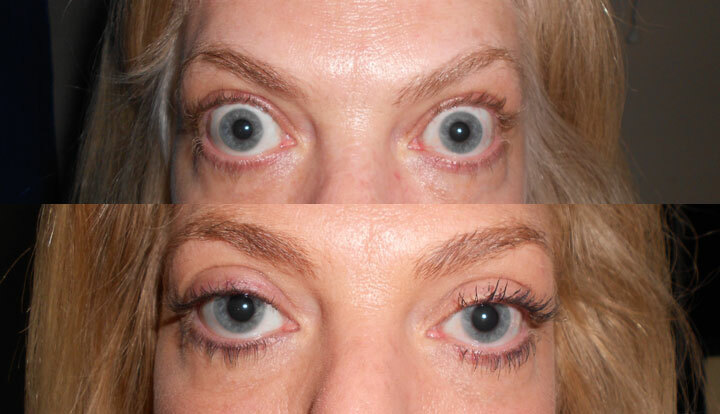 Upper and lower eyelid lifts (blepharoplasty) remove any excess skin and fat slippage, or prolapse, from the eyelids.